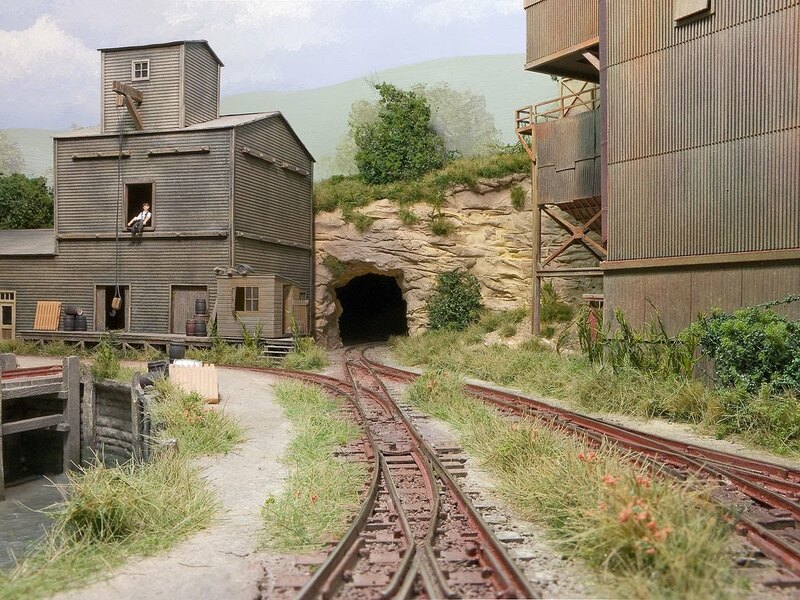 At last the little trainset is ready for Railex you'll be pleased to know. 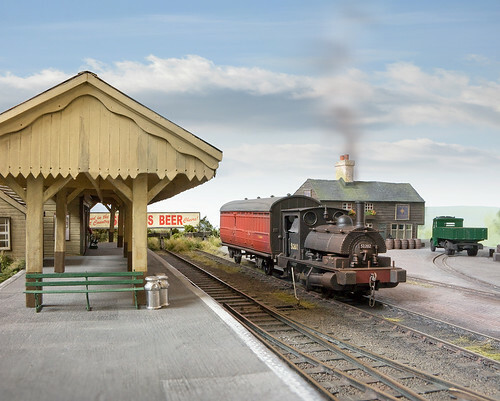 Shortly the house will return to normal as tools are put away (well for a few days anyway) and the floors made free of all the usual detritus that follows model railways around. Smudgie on the right will also be pleased to get 'her' room back too. Improvements this year for those who might have seen the layout before are improved brighter lighting, rejuvenated scenery, a traverser fiddle yard to replace the scary cassettes (scary because I could see a whole train becoming airborne all too easily) and a couple of extra items of rolling stock. 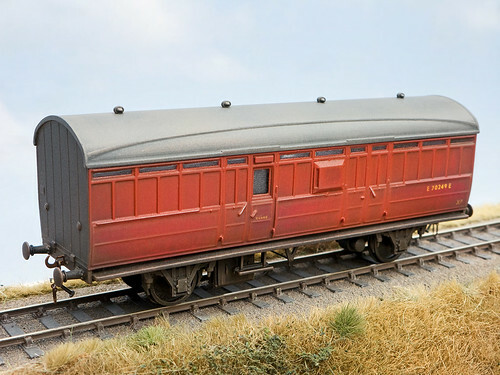 Oh yes, and before I pack it all into the car, I managed to do one more carriage, this time in RED, Ford Rosso Red to be precise which I gather is a dead ringer for BR carmine. Job done! I didn't think I'd have time to do this; a Bachmann Zillertalbahn carriage which has been stripped of its gawdy fairground livery and replaced with that of tired old varnished wood. 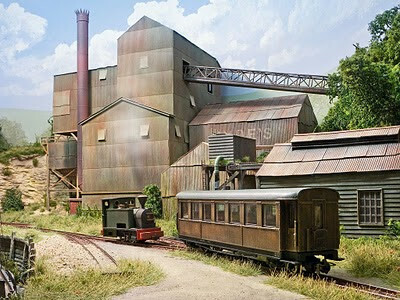 Much use was made of the technique of 'working' the almost set enamel used for weathering when it's slightly putty like as in a recent article in Model Rail by resident model maker extaordinaire George Dent. 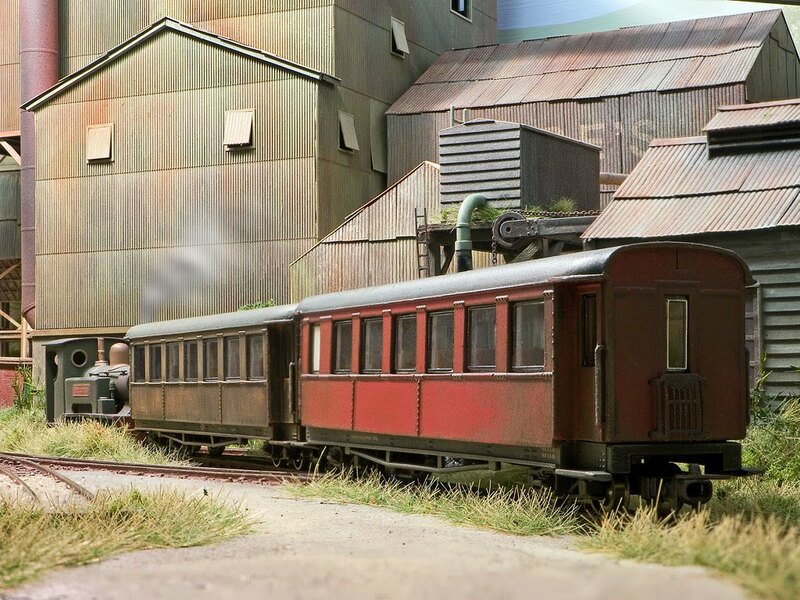 The carriage here started off with an all over coat of cream (Halford's Peugeot Antelope Beige), various brown enamels were then applied with a small stiff brush working vertically until the paint almost set to give a streaky effect. Finally Ronseal Satin Black (water soluble when wet) was then applied and then brushed off with a 2 inch decorator's brush. All was sealed in with Railmatch Matt Varnish from an aerosol. nevard_100525_arnewharf_IMG_6980_web, originally uploaded by nevardmedia. 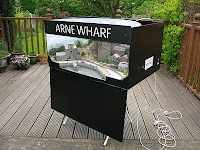 With just under 3 days to RAILEX, thoughts turned to Arne Wharf's cassette fiddle yard which was a right pain in the wotsit to operate. Operating something properly with rails just 9mm apart all weekend is going to be enough of a headache with stock potentially ending up on the floor. 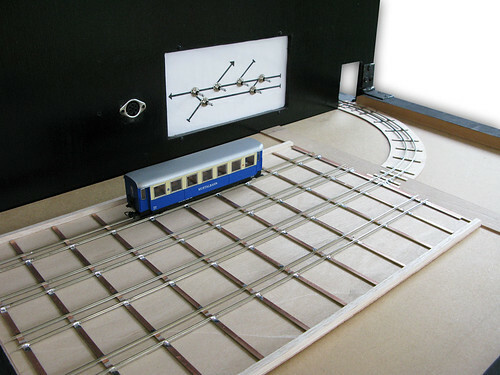 After much though its replacement is a new traverser yard which allows 4 complete trains to be stored, access to each road being a simple sliding action. 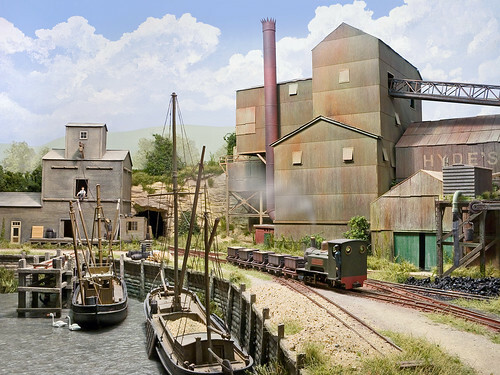 Above: 08630 departs from a rather run down Cement Quay with a short rake of PCA cement wagons. Most digital still cameras now have the option of being able to record video, with some of the very latest cameras being potentially capable of outperforming conventional video cameras. Indeed, some of the new breed of DSLRs are used in commercial HDTV production, with the large sensor giving a narrow depth of field much like a 35mm motion pictures camera like an Arri - something that is very much favoured by drama producers. The above short clip however doesn't get anywhere near HD or even low definition VHS, it simply being just a bit of fun to see if I can get a bit of movement onto the web. nevard_100513_arnewharf_IMG_6893_web, originally uploaded by nevardmedia. 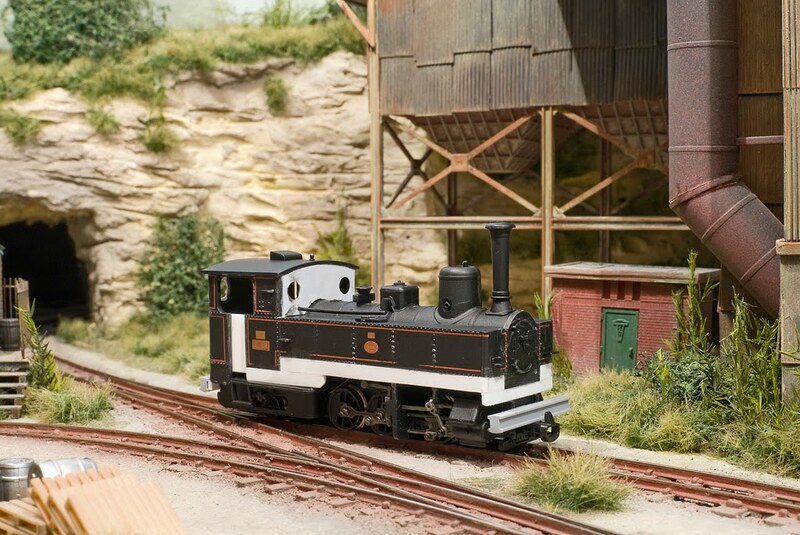 Captured in the midday sun, 'Hercules' a Kerr Stuart 0-4-0T rescued from Hampton Waterworks trundles across the wharf at Arne on the Isle of Purbeck with a short rake of gravel trucks. Shortly after this photo was taken the summer skies turned into a thunderstorm. nevard_100509_zillertal_IMG_6873_web, originally uploaded by nevardmedia. Following on from yesterday’s BLOG post ‘The Austrian with the English Accent’, also with the loco came 3 'Zillertalbahn' carriages in various gaudy liveries. Whilst they may or may not be authentic I have no idea, either way they currently have no place on Arne Wharf. 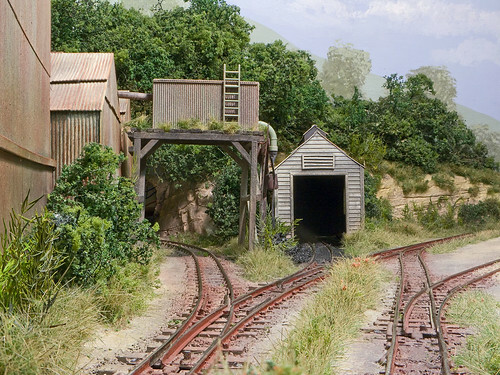 So I have 2 options, either to sell them or to have a bit of fun and modify them into something a little more interesting even though they’ll still be rather alien in style for running on a Dorset mineral railway. 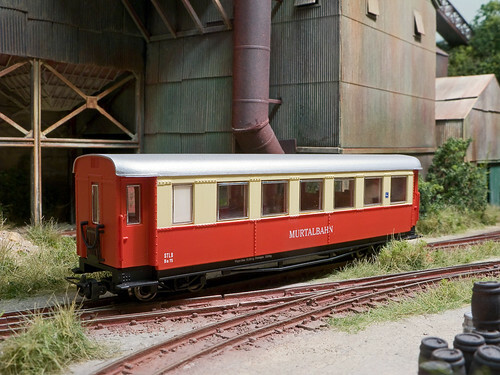 I’ve always rather liked the look of Swedish varnished wooden passenger stock, and looking at the design of these Bachmann Zillertalbahn carriages suggests that with a bit of work such a wooden finish would suit them rather well. I love that rose tinted parallel universe! 071012_arnewharf_zil_DSC9169_web, originally uploaded by nevardmedia. 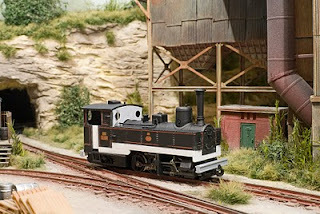 Having thoroughly enjoyed a feature in an old 009 Society newsletter on how to anglicise the Bachmann Liliput HO Zillertal Bahn 2-6-2, it reminded me that I had one of these locomotives hidden in the garage collecting dust. It was from one of those spur of the moment purchases a couple of years before, probably because I feared it was going out of production. Anyway, back to the conversion, I followed the instructions as in 009 News closely as possible as my spare parts box allowed, using plasticard to deepen the body and to revise the cab windows to something more British is style. I then had to improvise, not having a suitable smokebox door, I removed the flat head from a drawing pin, this becoming the door! A hole was drilled into the middle to take and old handrail knob from a Kays kit (there must be hundreds of these dreadful kits never finished?) and a pin head to act the lever for opening it. Further handrail knobs and bits of brass wire were used for the cabside handrails. British locos have less in the way of steam spaghetti than their foreign counterparts, so some of those bits were removed (I’m non technical, I know steam locos use coal, fire and water, that’s about it!). Some thin beading was added along the edges of the side tank tops from fine plastic strip. 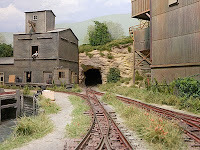 Then, some coal rails were added at the cab end of the tanks, after seeing a picture of the Former Welsh Highland Railway loco ‘Russell’ in a book of ‘The Railways of Purbeck’ by the late R.W. Kidner. The little loco then had a couple of ‘buffer beams’ added out of some spare girder section from a Walther’s Cornerstone building kit for that real DIY bodged repair often seen on industrial loco’s. I’ve always liked industrial grot over twee pretty engines, I think it would be true to say that it has been achieved here! That’s just about it, the loco was then sprayed matt black from an aerosol, had brass elliptical maker’s plate from a Class 52 Western of all things! It was then weathered up in my usual fashion using matt colour washes and dry brushing, until it started to look suitably decrepit. The loco, after a good couple of hours running round and round Arne Wharf it runs beautifully. The only problem is that due to the large overhang and my tight curves, non-bogie stock, irrespective of which way around the loco is facing, tends to get pulled off the rails on the bends so it's likely to only be seen on passenger trains for the time being. Whilst I’m not sure it looks totally British in style, it maybe could pass as something UK built for export to the colonies. My story is that it came back from war torn France after the Great War. nevard_100509_arnewharf_IMG_6851_web, originally uploaded by nevardmedia. A Roxey Mouldings 'Famagusta' Cyprus Govt Rly 2-6-2T built by Nasmyth, Gaskell and Company of Salford, pulls a short passenger train of second hand european origin through Arne Wharf (009) in 1962. Built in 1904 for mixed traffic on the 2ft 6in gauge Cyprus Government Railway, when the railway closed in 1959 it was repatriated to the UK and ended up in Dorset. Somewhere on the way the UK the handrails were mislaid! nevard_100407_arnewharf_IMG_6796_STEAM_web, originally uploaded by nevardmedia. 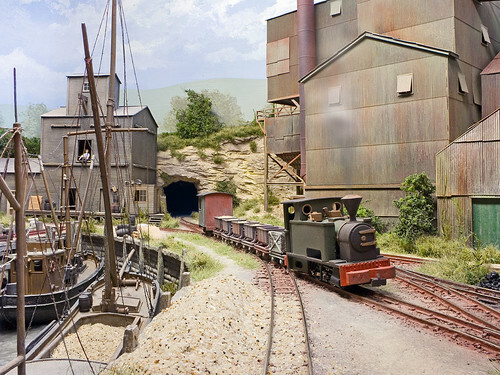 A short gravel train arrives at Arne Wharf. Its load will eventually find its way onto the barge on the left. nevard_100407_arnewharf_IMG_6777_web, originally uploaded by nevardmedia. 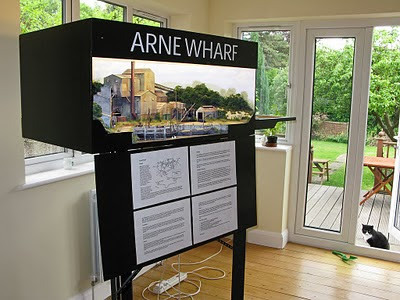 With the excellent RAILEX being just a few short weeks away, attention has turned to Arne Wharf as I listen to the Election results coming in. 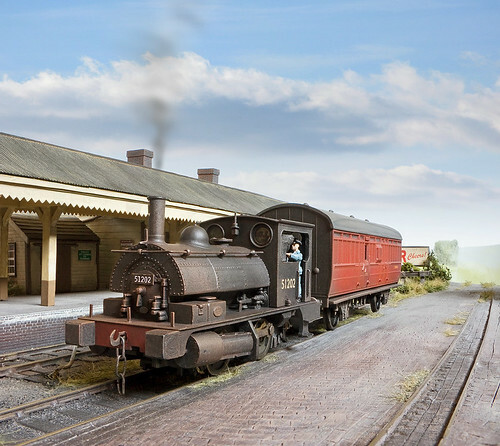 The little 3ft x 2ft 009 gauge micro has not been out for a couple of years, and what's more it's the only layout of mine that had until today not received a facelift with static grass and Noch Grasmaster. In addition to new grass, I've updated the built in lighting, the 2 clear blue tinted 100w bulbs being replaced with a 2 ft 18w fluorescent strip and a single 100 incandescent bulb. Why? Well, the 2 clear blue bulbs were very harsh and created double shadows on everything, and more importantly as the expire it's going to be increasingly difficult to replace them. The new mix of strip lighting gives me an even cool base, and the new single 100w providing a slightly warmer 'sun' with just one shadow. The close up shot here was taken under the new lighting - no studio lights! The static grass is also highlighted well here too - so much better than the popular ground foam ground cover which look nothing like grass! Heck, Helicon - you're good! nevard_100502_combwich_by_IMG_6730_web, originally uploaded by nevardmedia. Above: Ex Lancashire & Yorkshire Railway 'Pug' No. 51202 shunts the wharf sidings at Combwich in early October 1955. Over the last couple of weeks I've been messing about with Helicon Focus, the inexpensive layer stacking software, which when combined with photographs specifically taken for it can extend depth of field enourmously - in fact pretty well as much as you'd like! The shot above was taken on a 'point and shoot' Canon G9, one of the more recent relatively inexpensive small cameras aimed at the enthusiast photographer - of course any camera could be used, but I want to highlight the fact that you didn't need anything big and posh, because technique is the all important thing rather than kit. At this level of closeup the loco is probably bigger on your screen here than in real life if you click on the image then select 'all sizes' to reveal a decent sized view. It's not going to be possible to get everything in focus; so by shooting a few identical frames, but focussed on key spots, and then with the aid of Helicon Focus to combine the images one can create a greater depth of field. 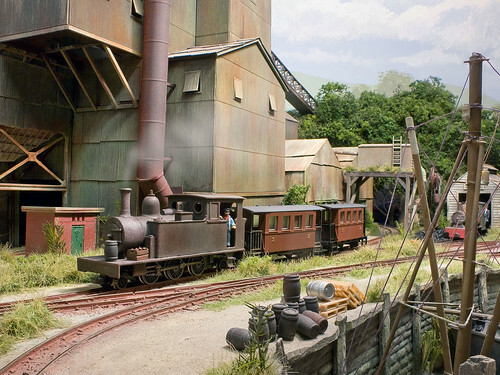 For this particular shot, three identical photographs were taken, the first focussed on the buffers, the second on the cab, and the final on the rear of the red van. The software then takes care of the rest on the computer - simple! The sky however was added in post production, it's far prettier than the wardrobe that was behind the section layout which was on the floor simply bathed in natural window light! nevard_100502_combwich_by_IMG_6741_web, originally uploaded by nevardmedia. An ex Lancashire & Yorkshire Railway 'Pug' No 51202 shunts the wharf sidings at Combwich in early October 1955. 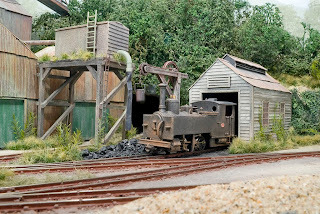 The loco is a repainted a detailed up Hornby, the van a Chivers Finelines LNER Dia 120 4W BY Pigeon Brake Van kit. The photograph is 3 identically composed shots, but focussed on different key points. The images were then combined with 'Helicon Focus' to extend the depth of field. Natural window light was used. The sky has been added as an extra layer to hide the spare bedroom wall. nevard_100501_lner-pigeon_IMG_6724_web, originally uploaded by nevardmedia. 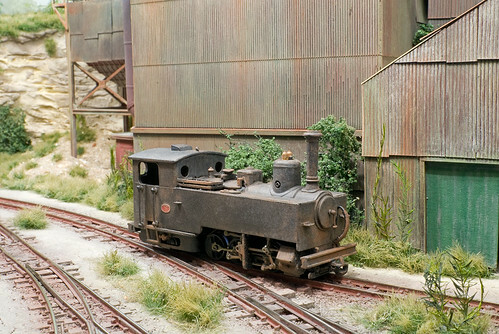 Chivers Finelines LNER Dia 120 4W BY Pigeon Brake Van after painting, numbering and weathering. Microscale Kristal Klear used for the upper window lights rather than trying to cut out clear plastic sheet and insert into the recesses on the rear of the side mouldings. To get the patina, after painting with Railmatch BR Crimson (aka carmine), the van was numbered with HMRS Pressfix transfers and then sealed under a thin coat of Railmatch aerosol Matt Varnish. Then, a water based mix of matt black and brown matt emulsion, diluted 70/30 with water and a dash of washing up liquid was slopped over and hastily wiped off with kitchen towel to leave the pigment in the groves. To get the slightly orange faded effect so often seen, some matt Humbrol signal red was drybrushed very lightly onto the raised surfaces. 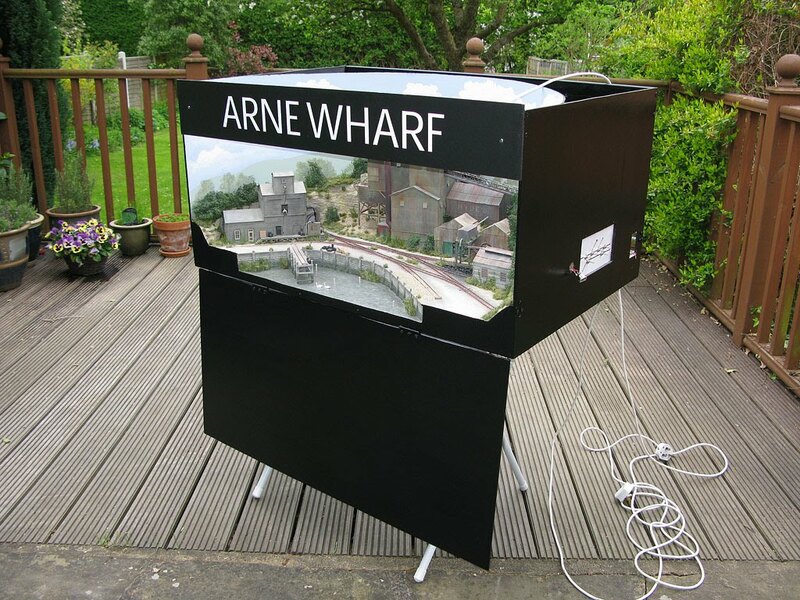 The roof was treated in a similar fashion, using Humbrol matt enamels - initially dark grey, and then drybrush on with a lighter grey leaving the darker grey exposed around the torpedo vents and rainstrip. Aerosol matt varnish was again misted on very lightly to seal the water based paint in and to produce a haze over the windows. All that's needed now are brake and presumedly steam heating pipes on the ends.